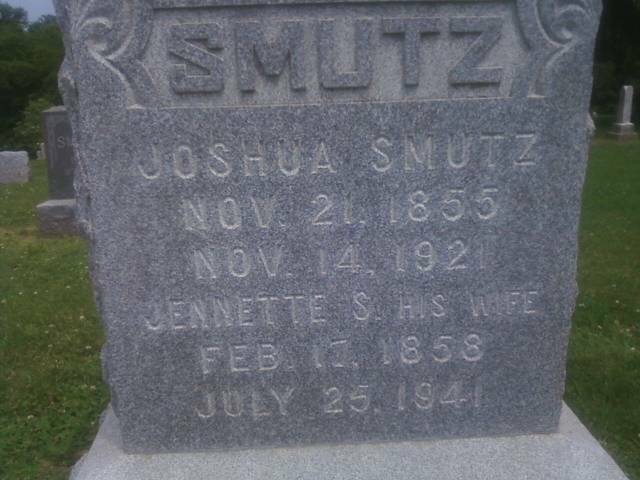 Today’s tombstone is located in Brunswick, Missouri and belongs to my husband’s great-grandparents, Joshua and Jennette Smutz. I took the photo of their gravestone in June 2013 while we were in Missouri on vacation. My sister-in-law has done quite a bit of research on the lines of my husband’s family. Joshua was born in Fayette county, Pennsylvania to Isaac Smutz and Sarah Stauffer on November 21, 1855. He married Jennette Herbert, daughter of John Herbert and Jennette Smith, on February 26, 1878. The couple had two sons (Earl and Layton) and four daughters (Maggie, Ora, Eva and Della Beryl – my husband’s grandmother). Joshua died on November 21, 1921. Jennette died almost twenty years later on July 25, 1941. They are buried in Elliot Grove Cemetery. 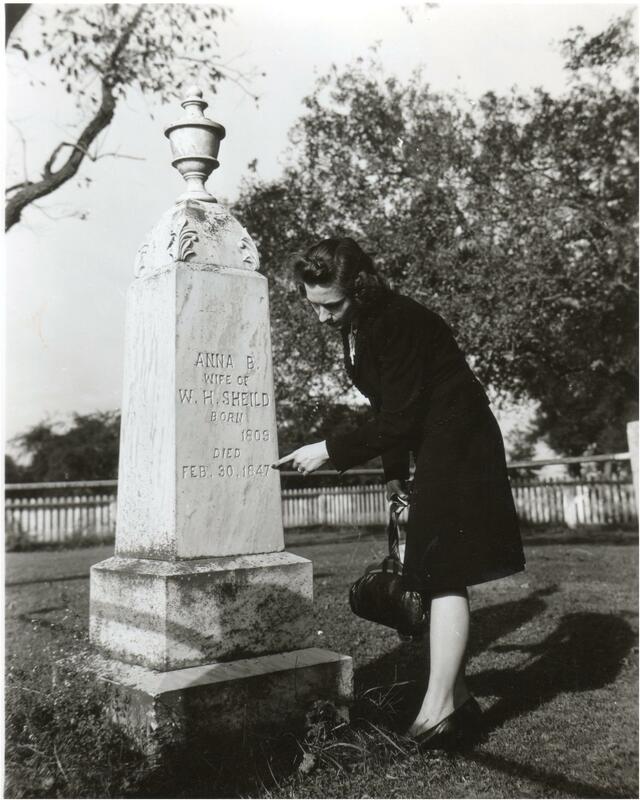 My grandfather took this picture of friend, Mary Lou Sowers, at the gravestone of Anna B Sheild, wife of W.H. Sheild. It was at the family cemetery at Moore House, Yorktown, Virginia. Even though the surname is familiar – these are not the Shield’s who married into my Johnson family. I believe one of the reasons this photo was taken is because of the incorrect date etched into the gravestone of February 30 – the last time I checked, February never had 30 days! For more information about Moore House, please refer to Moore House – Yorktown National Battlefield (or just google it!). The photo above was taken by a friend of my grandparents pre-1920 in Anderson, Madison, Indiana. 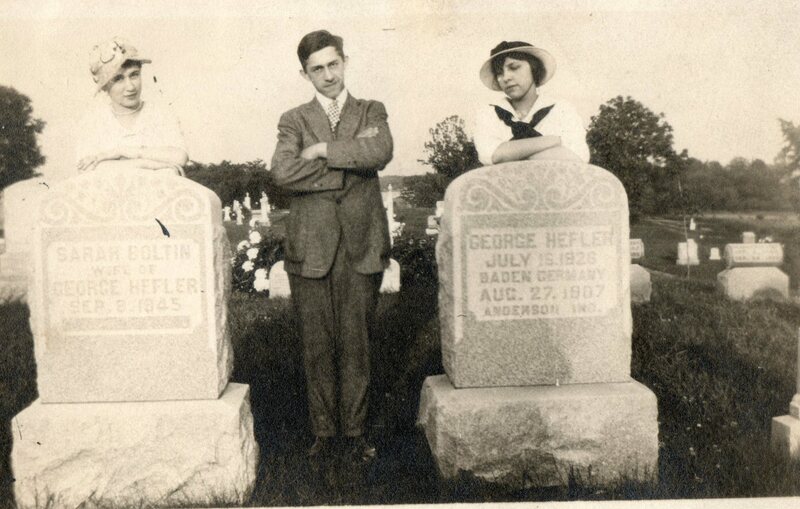 Glen R. Johnson (my maternal grandfather) is standing in between the two headstones and my grandmother, Vesta C. Wilt, is leaning on George Hefler’s headstone. The gal on the right, leaning on Sarah Boltin’s headstone, is a friend of the couple. When I checked Find a Grave, I noticed that the current picture of George’s stone is very difficult to read. Time and weather has deteriorated the readability – at least via a photo. At the time of the above photo, Sarah Boltin (George’s second wife), was still living. 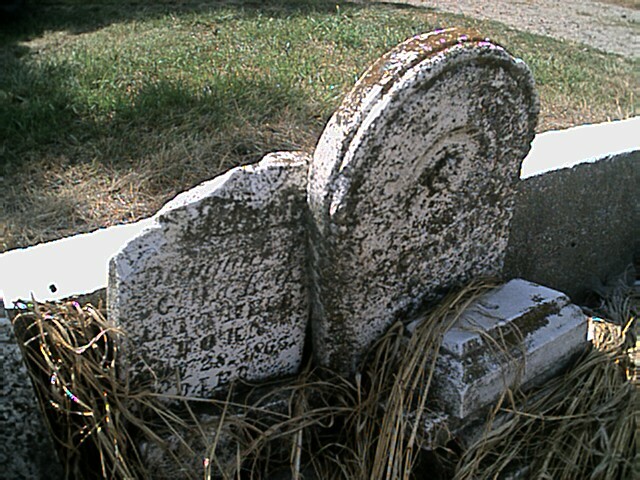 Currently on Find a Grave, it shows that her tombstone has broken off at the base and is laying on the ground. I have cropped a picture of each stone in the above photo and added them to Find a Grave. I do not believe that George Hefler nor Sarah Boltin are related in any way to my grandparents – the names have not come up in my research. The cemetery – Grove Lawn in Pendleton, Madison County, Indiana – is also the final resting place for many of my grandfather’s relatives – Johnson’s, Goul’s, and Blazer’s. The symbols are for Eastern Star and the Masons. They are buried in the Veterans area. At the edges of the family plot are markers with the initial “J”. Next to my grandparents is their baby daughter, Lois Evelyn, who died at 6 weeks of age – due to being premature and not being able to gain weight. Also buried in the family plot are my mother’s brother and his wife. The picture below is of my grandparents’ marker after I put flowers in their vase. Rest in peace, my family. This is the very small family plot for George Washington Littrell, his wife – Kitty O. Blakely – and their young daughter – Annie Elizabeth Littrell. The plot is now located on privately owned land in Chariton County, Missouri outside the city limits of Mendon. Luckily, the owners are aware this is a family plot and allow the family to visit the small burial ground. George Washington Littrell is the 2nd great-grandfather of my husband. He was born in 1828 and died just prior to turning 40 years old in 1868. Kitty was born in 1837 and died at age 42 in 1875. Little Annie was born in 1863 and died two years later in 1865. They parented many children who went on to produce many descendents. The first time I visited this sacred place, weeds had grown tall and obstructed the stones and littered the ground. My husband and I went back later to clear it all away. Each summer when we visit, we try to make sure the cemetery is cleared of debris and weeds. Most of my husband’s other ancestors, uncles, and grandparents are buried in Mendon City Cemetery located just next to his parents’ home. My children have visited that cemetery each year and taken countless photos of all the headstones. Photographed by Wendy Littrell in July 2002. Digital photo owned by Wendy Littrell (address for private use). 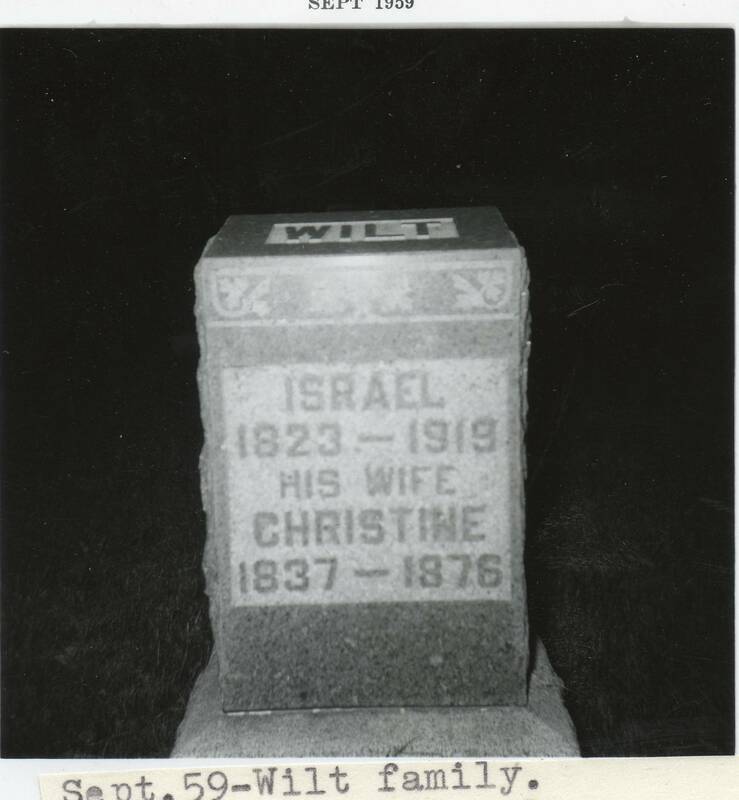 Gravestone of Sarah C. Wilt born to Israel Isaac Wilt and Christena Nash on Oct. 16, 1859 in Indiana. Married John Hofherr Aug. 16, 1894 in Delaware County, Indiana. Mother of Bertha May Hofherr Pierce. Died Aug. 27, 1928. Buried at Hawk Cemetery near Yorktown, Indiana. Survived by husband, two sisters, four brothers and three grandchildren. 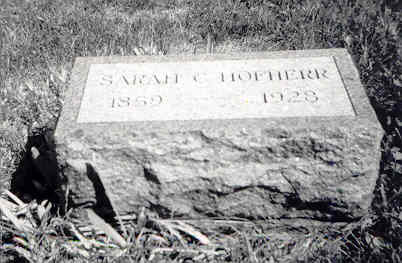 Sarah was my great-grandfather’s sister. Photographed by Glen R. Johnson (my grandfather). Original owned by Wendy Littrell (address for private use). My 2nd great-grandparents, Israel and Christine (Nash) Wilt. 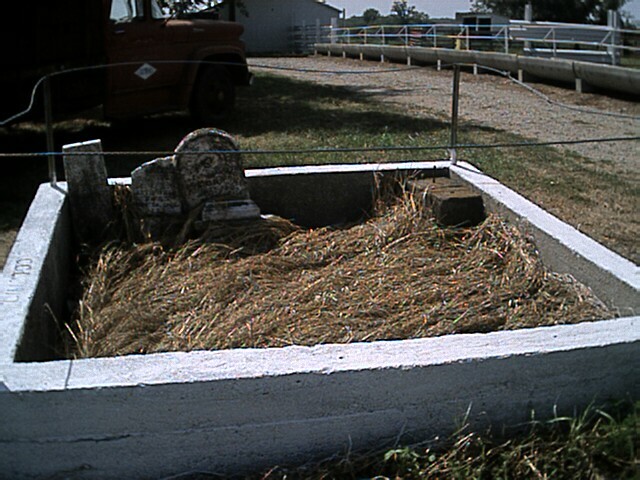 Buried in Miller’s Cemetery, Middletown, Indiana. Israel Isaac Wilt was born 20 June 1823 in Rockingham County, Virginia and died 11 Sep 1919 in Henry County, Indiana. He married Christine (also documented as Christena) Nash, daughter of Alexander and Elsy Nash, on 5 Feb 1857 in Prairie Township, Henry County, Indiana. She was born in 1837 and died on 18 Aug 1876 in Henry County, Indiana. Israel and Christena had ten children – 6 sons and 4 daughters (Jacob Marion, Sarah Christina, George A., Alice Jane, Clement V., William David, [my gr-grandfather] Joseph Napolean, Mary L., Ida Belle, and Charles H.). George A. and Ida Belle both died close to 2 years old. The others lived to adulthood.